July | 2011 | Perfect Storm Warnings! Few people could suggest with a straight face that the U.S. House of Representatives includes the best and brightest among us. In fact, most Americans are already well aware that the members of Congress struggle to represent anyone but themselves. Racism seems to be Representative Shelia Jackson Lee's favorite topic. Enter the lovely and talented Congresswoman Sheila Jackson Lee. 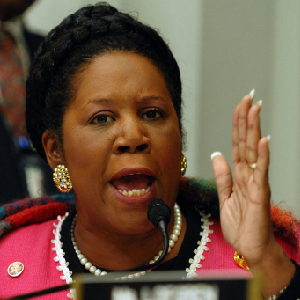 Friday on the floor of the U.S. House of Representatives, Texas Democrat Sheila Jackson Lee was back at it, raging from the people’s pulpit about her favorite topic: racism. The reason Republicans aren’t negotiating and aren’t willing to compromise on the debt ceiling, she said, is because of Obama’s race. Of course, she and her fellow Democrats treated President George W. Bush with the utmost in regard and respect. To be fair, Bush deserved some of the barbs he faced, given his profligate spending, harebrained schemes like No Child Left Behind, and his tendency to do things to the English language for which gave the writers at Saturday Night Live a lot to work with. I often wonder if progressives, including Ms. Jackson Lee, consider the fact that by laying the exhausted race card on the table every time Obama slows for a political roadblock, they are essentially saying that Obama is nothing more than some helpless racial avatar, incapable of accomplishment. Therefore, playing the race card in order to defend his every misstep is either an admission that he needs to be rescued with personal attacks on his critics, a revelation that progressives have no other cards to play, or that they’re just plain silly. Either way, the constant use of the race card by the likes of her only serves to keep the people of our nation divided when they so badly need to come together. Most people remember learning how to write in cursive back in elementary school. But now, children in Indiana’s school systems will no longer be required to learn to write in cursive, as Indiana’s Department of Education will make it optional for schools to teach this style of handwriting. Instead, the department is focusing on students’ keyboard use. Indiana will enforce more typing programs because it makes more sense in our day and age, as computers become a larger part of our professional lives. The memo says schools may continue to teach cursive as a local standard, or they may decide to stop teaching cursive altogether. One might ask how will each district be effected by budget considerations in the future when considering whether to continue teaching cursive writing. The state is moving from Indiana Academic Standards, which includes cursive writing in third grade, to national Common Core standards, which do not include cursive writing at all. Most states have adopted the Common Core standards, which aim to create consistent national benchmarks for all students, regardless of their home state. To see if your state is one that has adopted the Common Core standards, click here. The problems arising from students not being taught to write cursive should be considered. For instance, How will Indiana’s students know how to sign their name? When you’re born, someone signs your birth certificate. When you’re married, you have to sign your marriage license. When you die, someone’s going to sign your death certificate. All these things are important aspects of your life. A more immediate problem for students is the fact that the SAT test and Advanced Placement exams call for handwritten essays. Also, research has shown that handwriting does make a difference in the perception of a student’s knowledge and ideas. Legible handwriting may improve a student test score, while messy handwriting may detract from the writer’s ideas, she said. She noted that some employers consider cursive handwriting as important in day-to-day work. Learning to use a keyboard is important in 21st Century education, but until you find a way to sign your name on a form with it, you might also need to know how to write. Today a new country came into existence in Africa. On Saturday, July 9, Southern Sudan proclaimed independence. The move effectively strips Sudan, Africa’s largest country, of a quarter of its area — and the world has a new country, the youngest on the continent of Africa. Not only Africa, but the entire world is anxiously watching to see what happens in South Sudan. 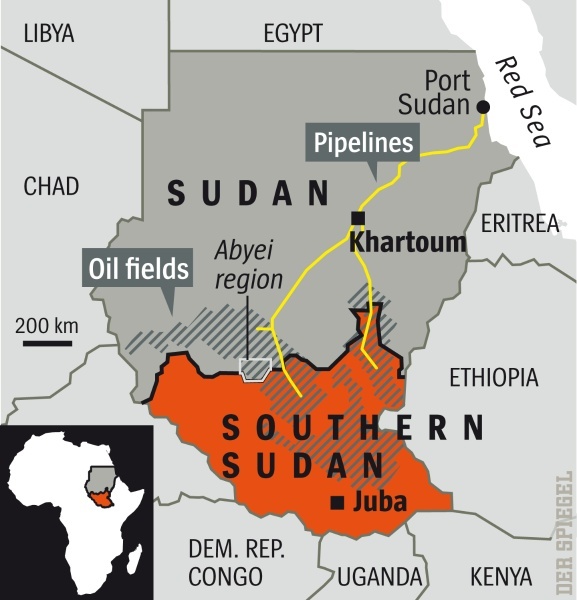 The new state is roughly the size of France and will have sole possession of and authority over more than 80 percent of Sudanese oil reserves. “The Republic of the Sudan announces its acknowledgement of the establishment of the Republic of South Sudan as a sovereign state within the 1956 boundaries,” announced Bakri Hassan Salih, Sudanese minister for presidential affairs. The reference to the 1956 boundaries, however, was controversial because that puts the contested region of Abyei in the north. The region, which is about the size of Connecticut, is home to the Ngok Dinka people, who are closely allied with the South, but it also serves as grazing grounds for northern Misseriya tribes. For 40 years, the Muslim north and the Christian and animistic south have been at war — disputes between the ethnic groups with Arab roots in the north and the Nilotic peoples living in southern part of the country have likewise always been part of the problem. The two areas were joined into one country in 1947 — though without any input from the south. And, in 1956, soon after Sudan was granted its independence by Britain and Egypt, civil war broke out. Brief interludes of peace notwithstanding, the conflict lasted five decades and cost more than 2 million people their lives. The south, despite being blessed with oil, plenty of water and fertile soil, became one of the poorest areas in the world as a result of the fighting. Around 80 percent of Southern Sudanese are Christians. During the 20-year civil war, the Muslim north tried to convert the believers in indigenous faiths to Islam, but people turned to Christianity. A half dozen warlords, veterans of the war of liberation, are now looking to stir up fresh conflicts. They had laid low until the referendum held in early January because they didn’t want to hurt the chances of independence, but they never have been truly integrated. In recent weeks fighting has erupted in Abyei again, sparking fears of another war. The U.N. Security Council voted unanimously to send up to 7,000 peacekeepers and 900 uniformed police to the new country of South Sudan. The Security Council is expected to meet again Wednesday to discuss U.N. membership for the new nation. The government in Khartoum is doing nothing that might contribute to stabilizing the south. And why should it? The north has debts of some $38 billion and the conflict surrounding the country’s oil reserves has not yet been resolved. From the north’s perspective, a stable government in Juba is not helpful. Most of the oil is pumped in the south, but all of the pipelines run through the north on their way to the refineries in Port Sudan, on the Red Sea. The proceeds have long been split, but now, the south is claiming a bigger slice of the earnings. But in addition to freedom, the new state would have to focus on a long term battle against poverty and hardship. The south has the world’s highest incidence of women dying during childbirth, and nine out of 10 women are illiterate. Half of the region’s population has to make do on less than a dollar a day. The designated president of the new state of Southern Sudan is 59-year-old Salva Kiir, a former rebel leader and freedom fighter. Kiir lacks the charisma of his predecessor, John Garang, who died in a helicopter crash in 2005. But he is a skilled tactician — a skill that could ultimately tip the scales. The only issue that Kiir hasn’t managed to settle with the north is that of oil revenues, which will undoubtedly ignite serious disputes after January 9. While the wellheads are in the south, the pipelines run north to Port Sudan, on the Red Sea. There, the oil is refined and put on ships for export. At the moment, the north and the south split the proceeds almost fifty-fifty. But the south wants to alter the arrangement: Since it has most of the oil wells, it thinks it should get a bigger cut of the earnings. In addition to freedom, the new state will have to focus on a long term battle against poverty and hardship. The south has the world’s highest incidence of women dying during childbirth, and nine out of 10 women are illiterate. Half of the region’s population has to make do on less than a dollar a day. On July 6th, President Barack Obama announced the designation of a Presidential Delegation to the Republic of South Sudan to attend the ceremony marking the Declaration of the Independence of the Republic of South Sudan on July 9, 2011. He named Susan E. Rice, United States Representative to the United Nations to lead the delegation. In addition to attending the ceremonies, Ms Rice is scheduled to meet with President Salva Kiir and will attend a ribbon-cutting to officially transform the U.S. Consulate in Juba into the U.S. Embassy to the new Republic of South Sudan. A majority of Americans believe that, in the wake of 9/11, toppling the Taliban regime and hunting down al-Qaida was the right thing to do. But now the war is in its 10th year and is costing $2 billion a week, and the United States is adjusting its priorities to conform with the widely held view that if Washington is to be involved in any reconstruction effort, it ought to be at home in America, where it is urgently needed. The United States remains mired in an economic crisis. Three years after the collapse of Lehman Brothers, unemployment remains high; the official rate is 9 percent, but the unofficial one is 16 percent. Growth is crawling along at less than 2 percent, and the country’s debt burden is swelling by $4.38 billion a day. Many cities are so broke that roads and bridges are in disrepair, and some areas of America already resemble a Third World country. The war in Afghanistan has been America’s longest ever. It began in the fall of 2001, just weeks after the attacks on New York and Washington. We went to Afghanistan for the right reason; we are staying for the wrong reason. In an internal briefing sent to senators last week by the White House in which the president states that “on the threat side we haven’t seen a terror threat emanating out of Afghanistan for the past seven or eight years” — a claim that conflicts with what President Obama has said publicly. Even General David Petraeus, former supreme commander of NATO forces in Afghanistan and now headed to the top position of the CIA, conceded as far back as May 2009 that al-Qaida is no longer operating in Afghanistan. The organization became decentralized a long time ago, with nerve centers spread around the globe. In Afghanistan, what we’re really fighting is not international terrorists, but a national resistance movement — and, in doing so, we’re creating exactly the thing we claim to be combating. For every civilian we kill, 10 more young people across the globe rise up, determined to strike back with terror. Last week I heard both from the Hollywood crowd and the Eastern political pundits talk of how President Obama is pulling the troops out of Afghanistan and singing his praised for doing so. They neglected to mention that he is also leaving about 90,000 troops in that war torn country! I’m not totally convinced that they are even aware of that minor detail. It’s time to bring ‘em home. It reminds me of how President Obama is credited with bringing the American soldiers out of Iraq and ending the war in that nation. Little is mentioned of the fact that roughly 47,000 soldiers remain in that country as well, still in combat gear and still in harm’s way. It’s time to bring them home as well! To say that we have these men and women in those countries to train the local military forces is ludicrous. If it takes Americans roughly 18-24 weeks to get trained to go fight in those countries, why is it taking 10 years to train theirs. Enough is enough. Bring ‘em home!